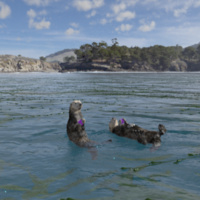 In Habitat Earth, viewers will discover what it means to live in today's connected world, where biological networks intersect with our own increasingly complex environment. Through stunning visualizations, audiences will dive beneath the ocean's surface to witness the dynamic ecological relationships within kelp forests, burrow beneath the forest floor to see how some of Earth's tallest trees depend on tiny fungi to survive, and journey to new heights to witness the intricate intersection between human and ecological networks. Narrated by Frances McDormand. As part of the 13 Days of Green. Light refreshments will be provided.